However, the Greek word translated as perfect in Matthew 5:48 can also mean “finished,” or “completed.”4 Instead of expecting people to be “without mistake,” Jesus may have been commanding them to be made whole through making covenants with Him. Christ’s statement is also similar to Leviticus 19:2: “Ye shall be holy: for I the Lord your God am holy,” or, translated slightly differently, “I would that ye should be holy as I, the Lord your God am holy.”18 Based on the similarities in wording between these scriptures, it seems reasonable that Christ was comparing holiness and perfection. In the scriptures, being holy means being set aside for the use of God.19 Christ thus may have been reminding us that we should covenant to devote ourselves to God.20 The context of this chapter also reminds us to love Him and our neighbors and to repent when we fall short, so the grace and power of Jesus Christ will be sufficient to make us perfect, ultimately complete, and one with Him. The Book of Mormon’s version of the verse is a command to be not only like God, but like Christ. For example, Jesus concluded his teaching to the people in Bountiful with the admonition, “Therefore, what manner of men ought ye to be? Verily I say unto you, even as I am” (3 Nephi 27:27). He also taught that one of the most significant ways we can be like Him is by making and keeping covenants: “be baptized in my name, that ye may be sanctified by the reception of the Holy Ghost, that ye may stand spotless before me at the last day...for the works which ye have seen me do that shall ye also do; for that which ye have seen me do even that shall ye do” (3 Nephi 27:20–21). Christ is the ultimate example of how to live, and His complete commitment to God is a reminder of how we all should live our lives.28 We can all covenant to be dedicated to Heavenly Father, just as Christ was. Like the people in the book of Joshua, we can all choose to serve the Lord rather than clinging to the negative influences in our lives. We can all leave behind “those things which were of old time” in our lives so that for us, “all things have become new.” This is how we can choose to live like Christ, and be perfected like He is. Moroni, in his concluding exhortation to all readers of the Book of Mormon, understood and conveyed this concept well: “And again, I would exhort you that ye would come unto Christ, and lay hold upon every good gift, and touch not the evil gift, nor the unclean thing. . . . Yea, come unto Christ, and be perfected in him, and deny yourselves of all ungodliness; and if ye shall deny yourselves of all ungodliness, and love God with all your might, mind and strength, then is his grace sufficient for you, that by his grace ye may be perfect in Christ” (Moroni 10:30, 32). President Thomas S. Monson, “Choices,” Ensign, May 2016, online lds.org. Elder Robert D. Hales, “To Act for Ourselves: The Gift and Blessings of Agency,” Ensign, May 2006, online lds.org. 1. 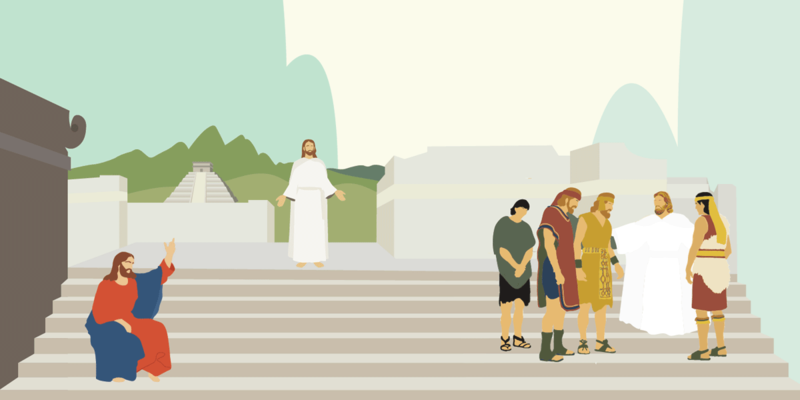 For a discussion of Sermon on the Mount in the Book of Mormon, See Book of Mormon Central, “Why Did Jesus Deliver a Version of the Sermon on the Mount at the Temple in Bountiful? (3 Nephi 12:6),” KnoWhy 203 (October 6, 2016). 2. To have everything in the Book of Mormon lead up to this point, and then to have Christ give a commandment that seems, at first, to be impossible to keep is puzzling, to say the least. See Joseph Fielding McConkie, Robert L. Millet, and Brent L. Top, Doctrinal Commentary on the Book of Mormon, 4 vols. (Salt Lake City, UT: Bookcraft, 1987–1992), 4:52–53. 3. See D. Kelly Ogden and Andrew C. Skinner, Verse by Verse: The Book of Mormon, 2 vols. (Salt Lake City, UT: Deseret Book, 2011), 2:161–163. 4. John W. Welch, The Sermon at the Temple and the Sermon on the Mount (Salt Lake City and Provo, UT: Deseret Book and FARMS, 1990), 58. 5. Welch, The Sermon at the Temple, 114. 6. See John Nolland, The Gospel of Matthew: A Commentary on the Greek Text (Grand Rapids, Michigan: William B. Eerdman’s Publishing Company, 2005) 270–1. See also R.T. France, The Gospel of Matthew (Grand Rapids: Eerdmans, 2007), 228–229. 7. The Old Testament describes both Noah (Genesis 6:9) and Job (Job 1:1), as “perfect” and Abram was commanded to be “perfect” (Genesis 17:1). Even animal sacrifices were expected to be “perfect” (Leviticus 22:21). See Johannes Botterweck, Ringgren Helmer, and Heinz-Josef Fabry, eds., “Tmym,” in Theological Dictionary of the Old Testament (Grand Rapids, MI: Wm. B. Eerdmans, 2003), 699–711. 8. Welch, The Sermon at the Temple, 119. 9. Moroni 10:32 helps to explain more about what this perfection means. It states that through God’s grace we “may be perfect in Christ.” The word with in Deuteronomy could be translated simply as in, suggesting that these phrases are basically the same concept. See F. Brown, S.R. Driver, and C.A. Briggs, eds., "’im," The Brown-Driver-Briggs Hebrew and English Lexicon (Peabody, Mass. : Hendrickson Publishing Company, 1996), 871–874. 10. These all are translated from the same Hebrew word, tamim, which appears in the Hebrew Bible more than one hundred times, and is often translated as perfect by the King James translators. See George Wigram, ed., The Englishman’s Hebrew Concordance of the Old Testament: Coded with the Numbering System from Strong’s Exhaustive Concordance of the Bible (Peabody, MA: Hendrickson, 1980), s.v., tmym. 11. This Hebrew word is closely related to tmm, which appears to derive from an archaic Hebrew word having a sense of “completion.” So, in Joshua 3:17, the children of Israel passed “clean over Jordan” or “tmm over Jordan” which could well be translated, “completely over the Jordan.” Similarly, in 1 Kings 6:22, when the Temple of Solomon was “finished” tmm appears again. It is likely that the concept of being “finished” or “complete” may also apply in the case of tamim. See Wigram, ed., Englishman's Hebrew Concordance, s.v., tmym. 12. There are actually several words that can be translated as “perfect” in the Old Testament, such as the Hebrew word salem, which is also translated as “perfect” in the King James Version of the Bible. This word may also be related to the word for perfect. See Welch, The Sermon at the Temple, 60. For more on how this word is translated in the King James version of the Bible, see Wigram, ed., Englishman’s Hebrew Concordance, s.v., shlm. 13. Welch, The Sermon at the Temple, 61. 14. For more on this, see Jonathon Riley, Holy, Without Spot: The Relationship Between Holiness and Perfection in Moroni 10:32–33 (honors thesis, Brigham Young University, 2012). 15. Welch, The Sermon at the Temple, 58. 16. Welch, The Sermon at the Temple, 58–59. 17. The word also is used to refer to the temple. For more on the temple connotations of the sermon, see John W. Welch, The Sermon on the Mount in the Light of the Temple (London: Ashgate, 2009). 18. Welch, The Sermon at the Temple, 119. 19. See Botterweck, Helmer, and Fabry, “Tmym,” 699–711. 20. Welch, The Sermon at the Temple, 61. 21. See Book of Mormon Central, “Why Is The Lord's Prayer Different In 3 Nephi? (3 Nephi 13:9),” KnoWhy 204 (October 7, 2016). 22. For more on the Sermon at the Temple, see Welch, The Sermon at the Temple . 23. Welch, The Sermon at the Temple, 94–95. 24. Welch, The Sermon at the Temple, 96. 25. On the relationship between covenants and becoming one with God, see Margaret Barker, “The Lord Is One,” BYU Studies Quarterly 56, no. 1 (2017): 75–97. 26. Christ constantly calls out to us to gather us together to Him, but we have to listen. See Brant A. Gardner, Second Witness: Analytical and Contextual Commentary on the Book of Mormon, 6 vols. (Salt Lake City, UT: Greg Kofford Books, 2007), 5:322. 27. This involves truly listening to Him and obeying Him. See S. Brent Farley, “The Appearance of Christ to the People of Nephi (3 Nephi 11–14),” in The Book of Mormon, Part 2: Alma 30 to Moroni, Studies in Scripture, Volume 8, ed. Kent P. Jackson (Salt Lake City, UT: Deseret Book, 1987), 149. 28. For more on how we can follow the example of Christ through living His gospel, see Robert L. Millet, “This Is My Gospel,” in 3 Nephi 9–30, This Is My Gospel, ed. Monte S. Nyman and Charles D. Tate Jr., Book of Mormon Symposium Series, Volume 8 (Provo, UT: Religious Studies Center, Brigham Young University, 1993), 1–24.